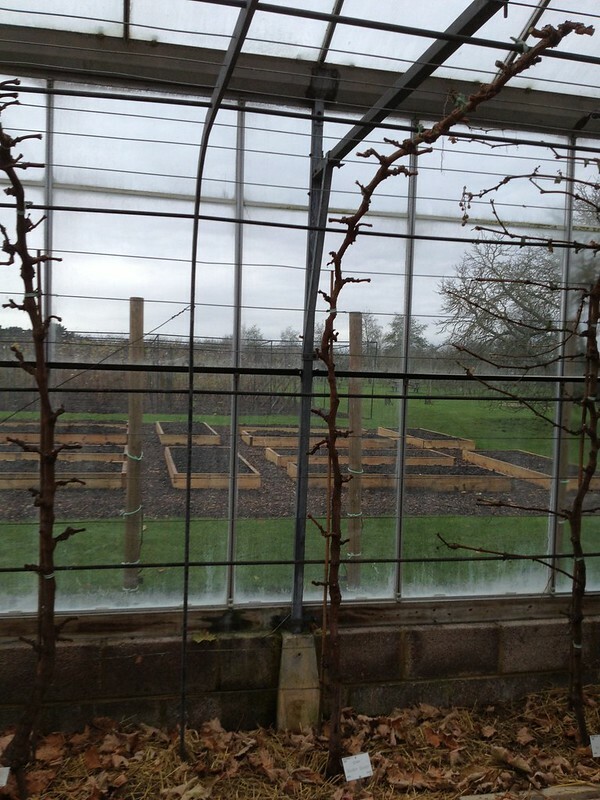 After tending to Vitis 'Muscat of Alexadria' as one of the first things when I arrived back in September, I have spent more time in the greenhouse, tending to the very demanding crops that indoors vines are. 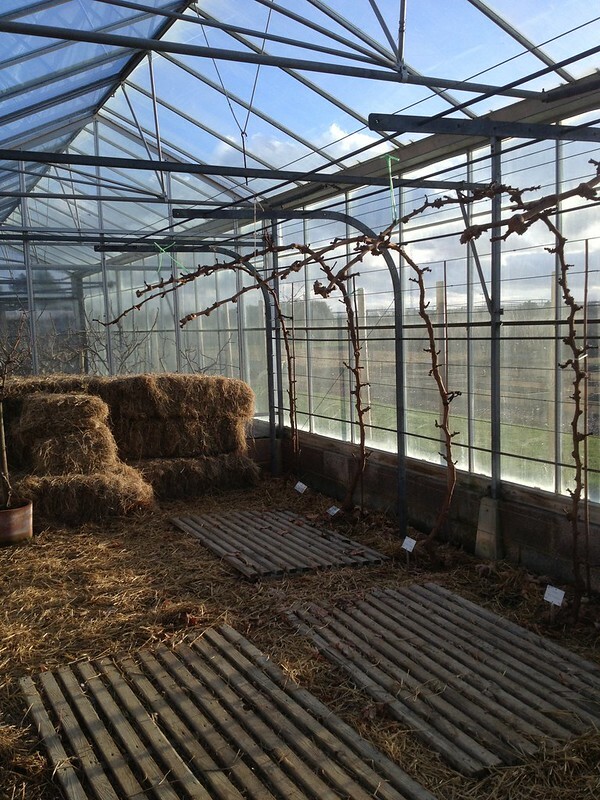 After all grapes are picked, the greenhouse's vents were opened, so the chill coming in stimulates leaf drop and the plants go into dormancy. 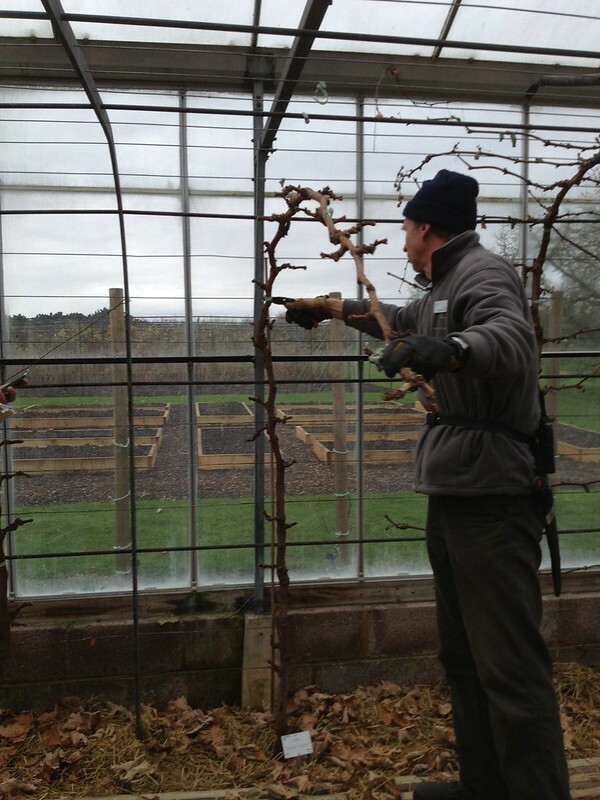 In December, it was time for pruning, and we got some training. 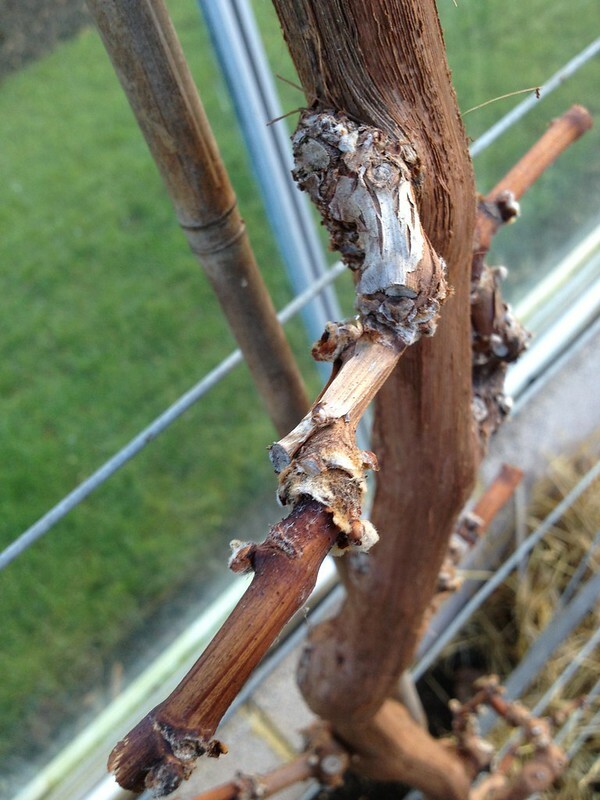 Our vines are grown with the "cordon rod and spurs" systems, which means that plants are planted 1-1.2 m apart, and trained as a cordon (only one main stem) tied to a frame; a fixed number of spurs (aligned with the wires) produce laterals that are then trained and tended meticolously to produce one, perfect-looking grape per branch. 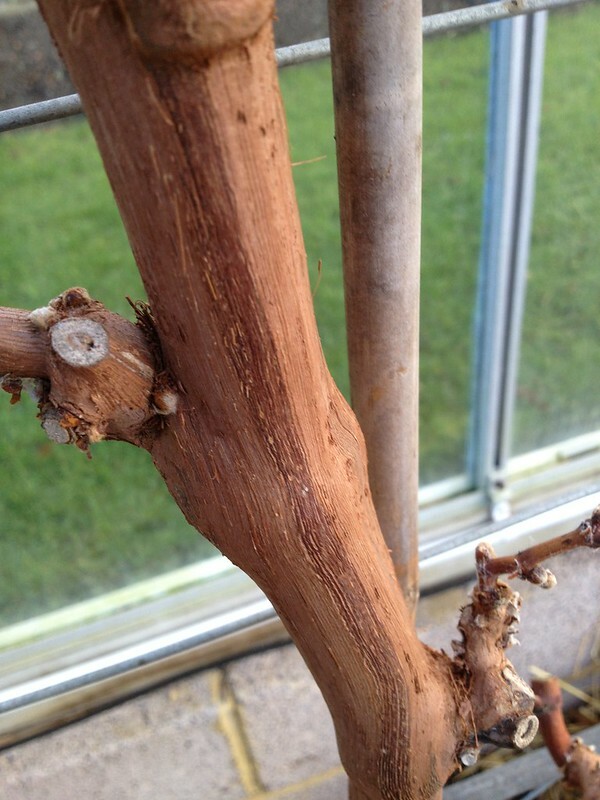 In December, the spurs are cut back to one lateral per spur, 2 buds per lateral: the objective is to keep the spurs short, so every so often old spurs are replaced with new ones, where a suitable branch had been allowed to develop over the year, but only if the wood is well ripened - you always have to choose just one lateral. 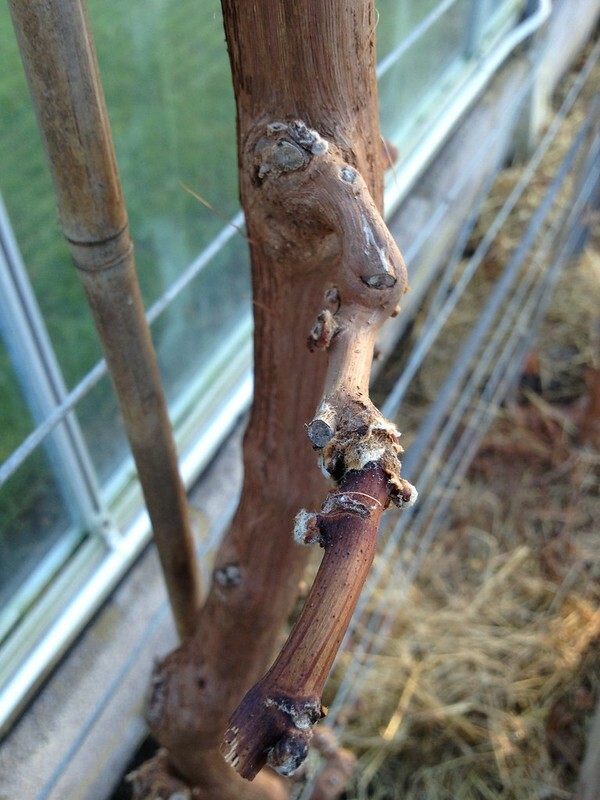 After that, the vines are untied from the frame, because buds break more evenly in the spring if they are not. 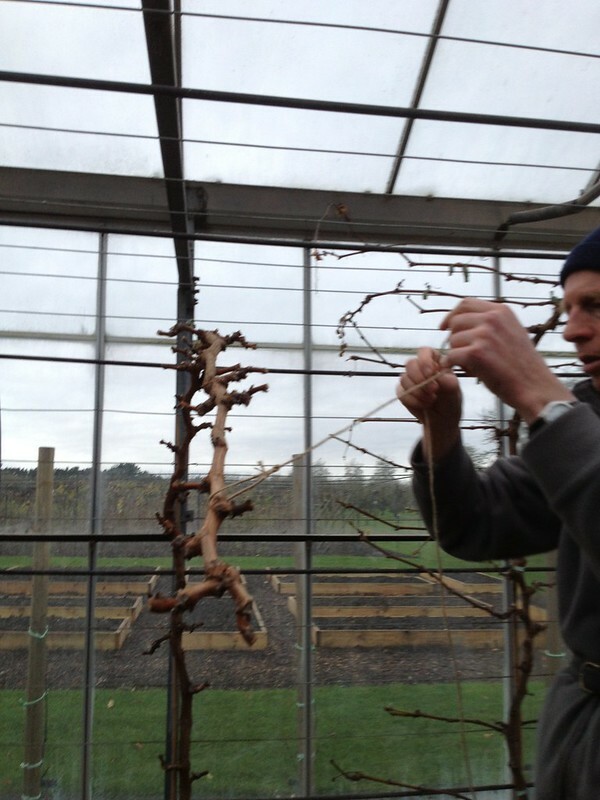 Untying is also useful because winter is the time for bark scraping. Bark scraping, or peeling of the bark, is something I spent a couple of rainy days in January and February doing, as it is the perfect task to keep one busy in such weather conditions! 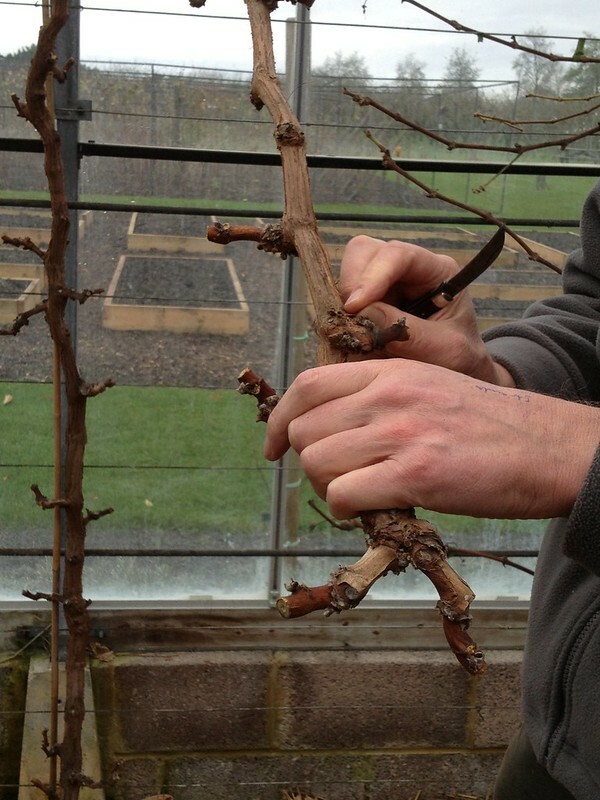 With the help of a (preferably not too sharp) knife, one peels the flaky bark of the vine off (it mostly comes away in long strips), so that pests cannot take residence that easily, and any that have are exposed and can be sprayed with a soap-based winter wash. Over the winter, the straw that is covering the soil, with a layer of compost, is also scraped away, removing some of the patogens it might host. Because some of the cordons are rather heavy, and in any case to take the weight off and avoiding swinging and snapping, the rods are then tied loosely. 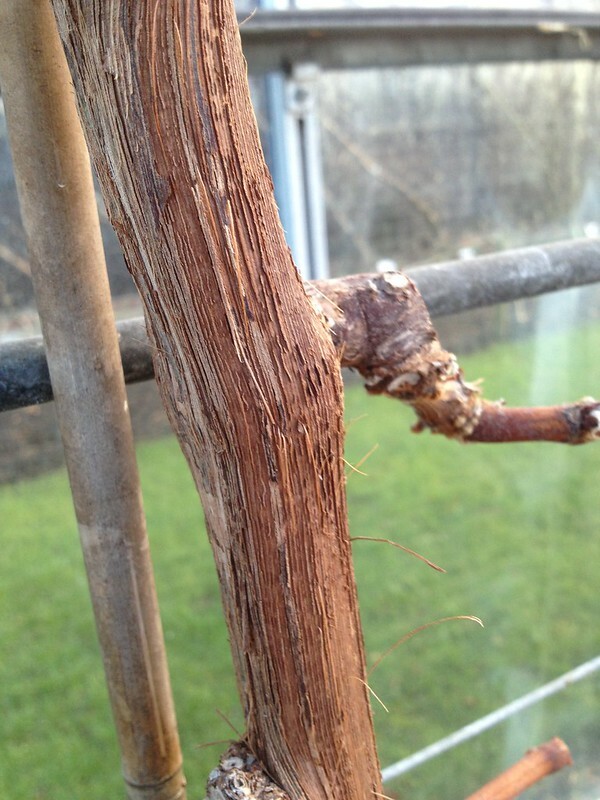 When they start to break bud, the rods are then tied close to the frame once again, and the new shoots are trained along the wires, which takes me neatly to the job I've been doing today: training of the new shoots.